1. Check List of Associated File Extension : We use a lot of application in our computer each with the different extension so remembering all those extensions can be hectic, so this command could be used to check the extension of any application. 2. Shudown Timer: You can also shutdown your computer at a specified time by setting the time. Follow the command below. 3. Display Message Before Shortdown: You can print a message before your computer shutdown by using this command. This will be helpful to the user as a reminder or for leaving a message for the next person who will use the computer. 4. These first set of commands will perform operations such as shutdown, restart or logoff. 6. Check Information : You can use config command to check all the information about your internet connection like IP address, Default gateway, and subnet mask. To view Subnet Mask, IP Address use this command. In order to view TCP/IP related Information use this command. To view DNS cache use this command. In order to delete the local cache of DNS use this command. 7. To Follow the internet related commands below. ( It is used when the server is currently not running any service). (It is used when the server is starting a service). (This command is used to check the services that are currently running). (This command is used for connecting to share network drives). (This command is used for disconnecting to share network drives). 8. this command for Star Wars IV Trick. Before doing that, make sure you have telnet enabled on your PC. 9. Check List of Drivers: Now you can check the list of all your drivers by using this command. 10. Create Private WiFi Hitspot: Now you can create Your Own WiFi Hotspot just follow the commands below. 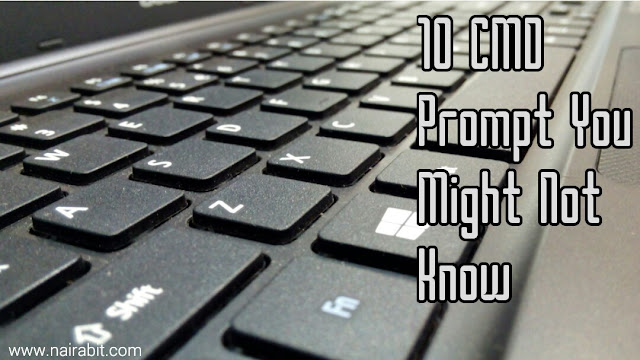 These are the must know tricks or command prompt codes that every windows user should know.